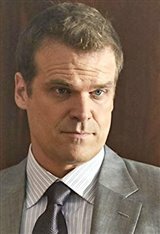 Born David Kenneth Harbour in White Plains, New York, David Harbour is an American actor best known for the Netflix science fiction horror series Stranger Things. His parents, Kenneth and Nancy Harbour, are real estate agents with his mother working the residential side and his father working on the commercial front. When he was in the eighth grade, he saw Kenneth Branagh’s Henry V (1989) and it changed his life, putting him on a career path to acting. He would later attend Byram Hills High School in Armonk, New York before graduating and going on to attend Dartmouth College in Hanover. New Hampshire. He graduated in 1997 with majors in drama and Italian. David began his professional acting career on Broadway in 1999, in the revival of The Rainmaker. He would make an appearance as a waiter on Law & Order the same year, and would later appear in the spin-off series Law & Order: Special Victims Unit, playing the child murderer Terry Jessup as his first major screen role. Over the next decade David would nab roles in several major films including the title role in Kinsey (2004). He also played Randall Malone in Brokeback Mountain (2005), Dracula in Awake (2007), Gregg Beam in Quantum of Solace (2008), Brian in Every Day (2010), and Scanlon in The Green Hornet (2011) before landing a recurring role on the TV series Pan Am in 2011. Television is where David would further establish himself with regular roles on series such as HBO’s The Newsroom from 2012-2014, Fox’s Rake and WGN America’s Manhattan (both in 2014) HBO’s The Newsroom, and NBC’s State of Affairs from 2014-2015 before really hitting the mainstream and becoming a pop culture figure in 2016 in the role of Jim Hopper on Netflix’s Stranger Things. David can next be seen in the upcoming third season of Stranger Things. During hiatus from the show, he filmed the title role in the movie Hellboy (2019), Lionsgate’s reboot of Mike Mignola’s comic creation. David, who was diagnosed with bipolar disorder at age 25, was previously engaged to actress Maria Thayer. New movies in theaters - After, Hellboy and more!